[Peter Skaarup’s] been re-living the past by playing old-school games in DOSBox. He’s using a mouse as the controller but longed for the auto-fire button that many joysticks used to have. Instead of looking around for a gamepad with this feature he decided to add an auto-fire button to the mouse. 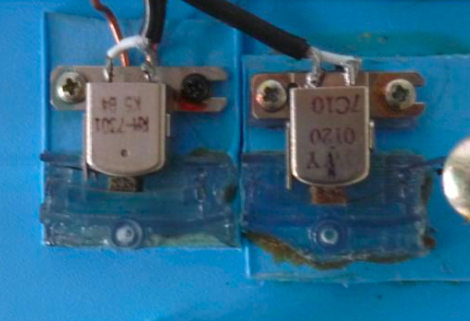 He incorporated a PIC 10F200, along with a momentary push switch and a transistor. The push switch enables the autofire feature, causing the transistor to short the left mouse button about seventeen times a second. 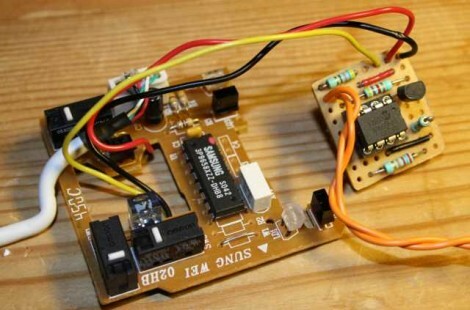 Problem solved, and with a couple of other pins on the microcontroller there’s room for this project to grow. Interested in an auto-fire feature for your gaming console? Perhaps this Xbox 360 rapid fire mod will give you some inspiration. Professional tape delay units are great fun, but often expensive. You’d think that with so many derelict cassette decks filling the world’s dumpsters someone must have figured out a way to make a cheap tape delay… not only in the interest of saving money (sometimes quality is worth paying for) but also in the interest of re-using otherwise wasted resources. Forosdeelectronica forum user [Dano] has made just such a device from used cassette decks and miscellaneous parts (translated). First he investigated the operation of the playback, erase, and record mechanisms and broke out the tape heads. The playback head is on a plastic rail so that the delay time can be changed, while the record head is fixed. [Dano] encountered some difficulties in ensuring good quality for the recording and erasure, which is an important consideration when working with magnetic tape. We got a pleasant letter from [Eric Willhelm], the owner of Instructables. He wanted to shoot a token of good will our direction, in the form of an EPUB of some of the projects we’ve linked to in the last quarter of 2010. These are Ad-free and have all images included. You can download it and view it on the e-reader of your choice, or even in your browser with the appropriate plugin. The videos still link back to Instructables, but he thought our readership might enjoy having an ad-free experience. He says that link should work for about a month. 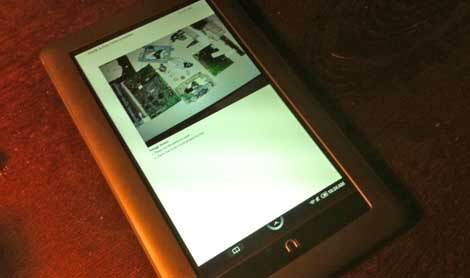 For those who really want ad free content and are willing to pay for it, Instructables has been putting out publications that are collections of instructables on certain topics. For example, [Eric] pointed out that they’ve compiled some that might be of interest to us like “Better living through microcontrollers” and “Amazing LED Projects“. Actually, there are a bunch of titles and it looks like some are free as well. Thanks [Eric], I’m sure your actions gained a little respect, even from those who dislike Instructables generally due to ads and registration. 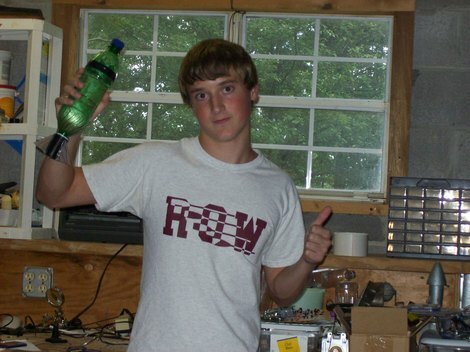 [cmwslw] built a soda-bottle water rocket that uses the ignition of oxyhydrogen gas to quickly expel the water, as opposed to the usual compressed air and water mixture. His project contains excellent documentation with photos and it builds on other articles he’s written about generating the flammable HHO gas used to launch his craft into the skies. Every aspect of this project uses items most of us have at home or could score cheaply at most hardware stores. We love seeing projects that re-purpose everyday materials into something fun. Just be sure to dodge the missile pop bottle as it speeds back to Earth! 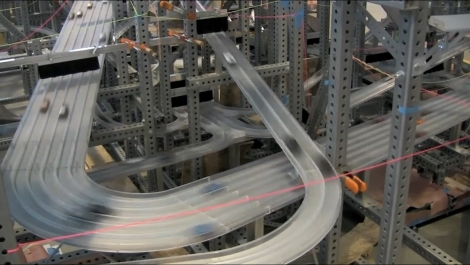 The blurry image above is a snap of toy cars as they zoom around a multi-lane, multi-level, maniacal-maze called Metropolis II. We originally took a look at the video after the break (do it now!) but found more information on [Chris Burden’s] kenetic sculpture in this NYT article. He and eight studio artists began work on the project back in 2006. They built 1200 custom designed cars and gave them a huge city to traverse, with up to 18 lanes at times. The work is not yet done, and the video below is dated (having been filmed in 2009), but project is slated to conclude in about two months and the installation has already been snapped up by the Los Angeles County Museum of Art. And here we thought this was the product of an out-of-work packaging system design engineer. Nope, it’s art, and it certainly eclipses other kinetic sculptures we’ve seen.